The May They Be One (MTBO) Bible continues to make its presence felt in homes and families. More and more parents and children are now reading and studying the Bible together. A good example is the Pallarca family – the winner of the 2011 Northern Region Catholic Family Bible Encounter. Husband and wife Danilo and Marilou with their children David Michael, aged 24, twins David Micho and David Michee aged 16 – from the Diocese of Cabanatuan – belong to one of the 16 families who received MTBO Bibles under a partnership program between May They Be One and the Catholic Family Bible Encounter. The Encounter requires each participating family to read the entire Bible – from Genesis to Revelation. The Pallarcas said that they have previously never read the Bible together though they were active in church. But when they did start reading and memorizing portions of the Scriptures, the experience turned out to be fun. The practice also strengthened their bond as a family. The children are thankful that despite their parents’ busy schedule, they made time for studying the Word of God with their kids. The youngsters were greatly inspired by this family activity and said that they want to continue the family reading of the Bible even after the Encounter. Young as they are, the Pallarca kids have decided to commit themselves to serving as volunteers in the Basic Ecclesial Community (BEC) in their area to teach others and help spread the joy of reading the Bible in every home. Target No. of Bibles for Distribution for 2011: 400,000 cps. Members of the MTBO Advisory Committee: Bishop Broderick S. Pabillo, DD, Ambassador Henrietta T. de Villa, Mr. Rod Cornejo, Mr. Rene E. Cristobal Sr., Dr. Philip C. Flores, Mr. Dante M. Lanorio, Fr. Oscar A. Alunday, Fr. Antonio B. Navarrete, Fr. Art Orense and Mr. Albert Tanlimco. May They Be One Bible campaign is a nationwide program which aims to distribute 5 million Bibles in 7 years. Learn more about how you can be part of the Campaign. Call us at PBS 526-7777, ECBA 527-9386 or visit www.bible.org.ph and www.ecba-cbcp.com. Donations can be deposited in the following bank accounts: PBS-MTBO Account#3903-0649-34 (BPI Sta. Mesa Branch) Fax deposit slip to 521-5803 or ECBA-CBCP Account #0251-021376 (BPI-Tayuman Branch) Fax deposit slip to 527-9386. For credit card payments – go to PBS website (www.bible.org.ph). In Gamu. Isabela… Fr. Antonio Ancheta dreams of having each of the St. Rose of Lima parishioners in the 16 barangays under his care to get their own Bibles. The need for Bibles became more apparent after he started a Gospel Sharing program last September 2009, where many attendees could not afford to buy their own copy of the Word. However, a happy turnaround occurred when Fr. Ancheta joined the May They Be One Bible (MTBO) campaign, which made the Bible available to the poor parishioners at an affordable price. At present, 320 families in his parish now have their own MTBO Bibles. Fr. Ancheta joyfully recounts that through the MTBO Bibles, the people not only hear about Jesus – they also encounter Him for themselves through their own personal study. Fr. Ancheta said that the people are now more responsive to the Gospel message, progressively applying in their lives the principles they learn. The St. Rose of Lima cleric also notes that his parishioners have become more prayerful and that church attendance has considerably improved. Bibles Distributed (Jan 2010 – Dec 1, 2010 ): 177, 563 cps. Target No. of Bibles for Distribution for 2010: 200,000 cps. “Glory to God in the Highest” used to be the parish slogan written on the glass facade of the St. John Bosco Parish in Laguna. But after a prankster threw a stone through the glass panes, all that remains of the signage now are the letters “st” from the word “Highest.” A misfortune it may seem, but for parish priest Fr. 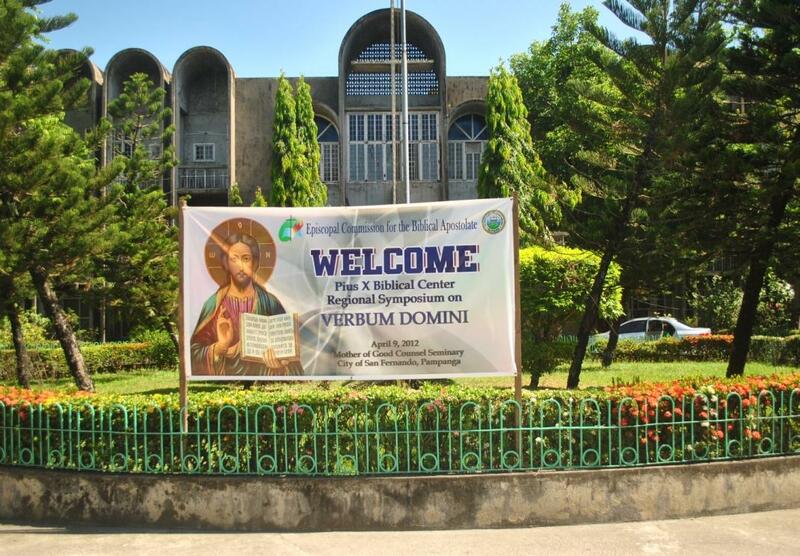 Rolo Alcasid, SDB it was a providential sign –the remaining letters were a reminder of their mission to bring God’s glory to every community STREET. 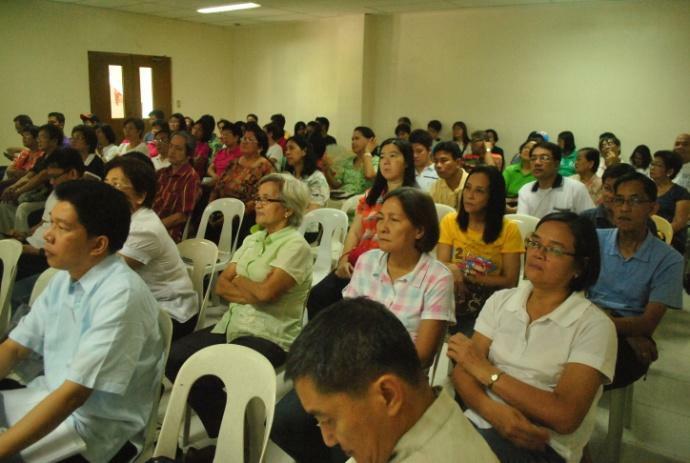 Last year, with the help of the parish’s partnership with Faith Comes By Hearing and The May They Be One Bible Campaign, the attendance in an ongoing Basic Ecclesial Community (BEC) increased. The parish leaders formed BEC clusters per street and conducted regular Bible Studies which involved listening to the Gospel from the Proclaimer Audio Bible while simultaneously reading from the MTBO Bibles. The regular encounter with God’s Word provides the attendees the opportunity to reflect on their relationship with God and its effects in their lives, families and communities. One mother says she has become more forgiving towards her neighbors and gained more self control. She is no longer the cause of trouble in the community but has become the person that people seek when they have problems. 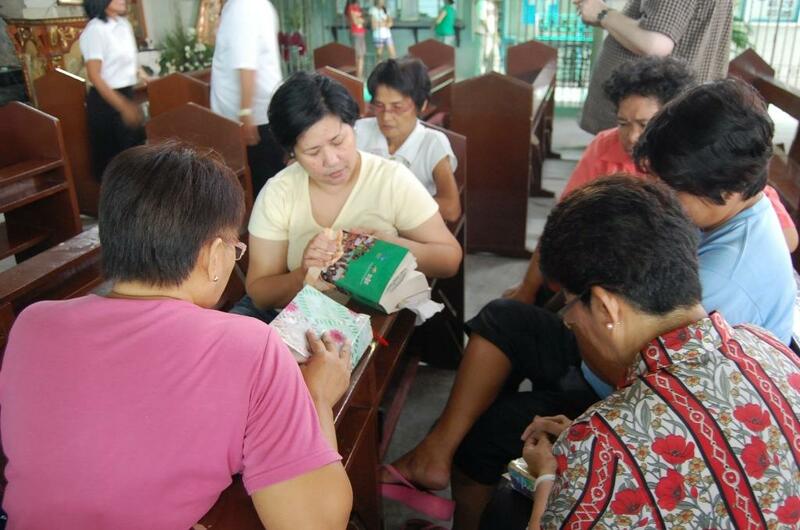 The St. John Bosco Parish now conducts Bible Studies not just per street but also with specific groups like tricycle drivers, construction workers and barangay tanods. Bibles Distributed (Jan 2010 – November 2, 2010): 167,923 cps. During the May They Be One (MTBO) Bible Campaign 2nd Anniversary Celebration at the Manila Cathedral on September 30, 2010, the Philippine Bible Society (PBS) staff offered up their coin banks to provide MTBO Bibles for poor parish communities. 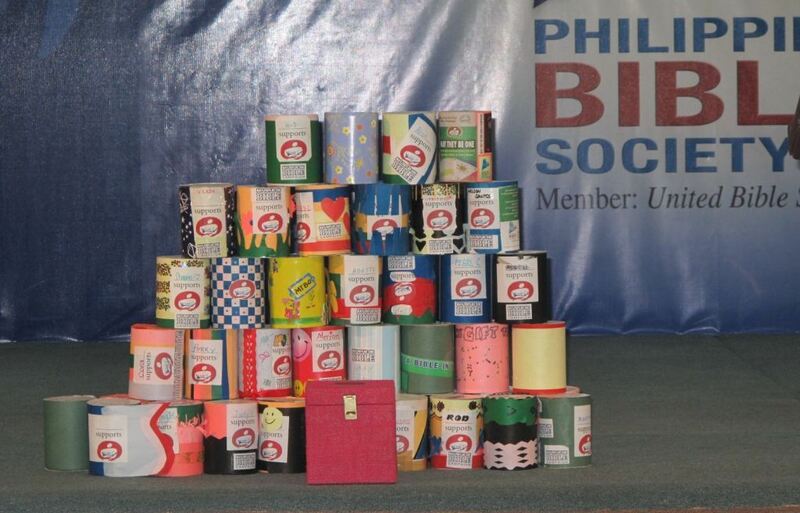 The coin banks were part of Biblia sa Bawat Bahay (BBB), a project launched in December 2009, to mobilize the PBS Family to give their share to the Bible Campaign. PBS staff gaily decorated their coin banks into which they dropped loose change to save up for the MTBO Bible campaign. On top of the coin savings, the staff also pledged amounts from their own salaries as their main contribution. To date, giving has exceeded BBB’s target amount of P100,000 and has reached P122,425.30. Of this amount, P23,399.20 came from the coin bank collections. Selected as first beneficiaries of BBB were the families of Our Lady of Guadalupe Parish in Marikina, led by parish priest Fr. Emanuele Borelli. It would be recalled that the parishioners lost most of their Bibles in floods brought by Ondoy last year. An initial MTBO Bible distribution in November 2009 significantly boosted the parish’s effort to recover their lost Bibles. BBB subsidized 50 additional MTBO Bibles for the parish’s 2nd Bible distribution held on Sept 29, 2010, bringing much joy and encouragement to members hungry for God’s Word. Parish priest Rev. Fr. Gerard Ariston Perez, seeking to widen his borders in the spread of God’s Word, brought the May They Be One (MTBO) Bible Campaign not only to the Holy Guardian Angels Parish in Tuao, Cagayan but also to the rest of the Archdiocese of Tuguegarao. Partnering with Biblical Formation teams, eight parishes started working together in June 2010 to distribute some 2,500 MTBO Bibles in their communities. Heads of families, trained to lead the 7-step gospel sharing method, led Bible sharing groups in their communities. The Sambuhay (misalette) which contained the Sunday Gospel, was previously the closest the people got to a Bible. Now, MTBO Bible recipients are privileged to have copies of the whole Bible that they say they now read regularly. They recount that the regular Bible reading gave them a greater capacity to feel God’s love and experience His grace and presence, especially in times of need and danger. The effects of the parishes’ united efforts in the MTBO Bible Distributions are now being felt in the community as the residents are now noticeably more open and generous to each other. They have also become actively involved in the concerns of their parish and its work in the community. As the Biblical Apostolate Coordinator in the Diocese of Surigao, Sister Blesilda Divino, OSB has always dreamt of bringing the Bible to the far reaches of Mindanao. This is easier said than done, however, as some parishioners are not able to read. But the May They Be One (MTBO) Bible Campaign through its partnership with Faith Comes By Hearing (FCBH) resolved the communication problem when it launched a Bible Listening Group program that uses both the audio Bible or the Proclaimer and MTBO Bibles. Now, God’s Word can be heard and read simultaneously. One of the facilitators trained in Sister Blesilda’s group testifies that reading her MTBO Bible while listening to its narrated version has helped her understand God’s Word better and immediately apply it in her life. “Whenever I hear Jesus preaching a sermon in the Proclaimer, it’s as if Christ Himself is talking to me personally – I am humbled. This allows me to change my ways.” The project in Surigao is only one of some 150 Bible Listening Groups (BLGs) in MTBO/Catholic communities that are enjoying the blessings of the MTBO-FCBH partnership that began in January 2010. Leaders from Laguna, Benguet, Dagupan, Pangasinan, Vigan, Urdaneta, Laoag, Abra, Bacolod and Surigao have undergone training to lead BLGs. The results are affirming God’s Word in Romans 10:17 that faith comes by hearing the message and the message comes through preaching Christ.